Who wouldn’t have experienced love? When you get a chance to get your story featured along with Durjoy Datta, the master storyteller, you wouldn’t have thought twice to take part in the contest. This is what has happened here. The book is the end result of some of the brightest minds out there who gave a different dimension to LOVE. 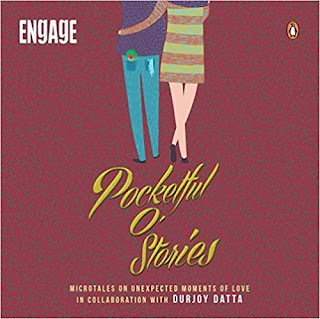 ITC Engage brought together some of the brightest minds out there to give a whole new dimension to LOVE with the latest book ‘Pocketful O’ Stories’ authored by Durjoy Datta. When you get to read micro tales from different people (who can now refer to themselves as published authors), you would surely be in awe! In an exciting crowd sourced campaign to invite microtales that celebrate unexpected moments of love, more than 400 best stories have been compiled into a book. More than 10 stories from Durjoy Datta’ own moments to represent an intriguing journey of playful romance. Yes. You could get to experience LOVE in its various forms. When you get to read micro tale stories from different people (who can now call themselves as published authors), you would surely be in awe. There are more than 400 stories (450 to be precise) with 10 stories from Durjoy Datta himself. I loved the way the book was made. It is handy and a classic since each and every page is in maroon color. I cud experience the Cupid taking various forms and shapes in each and every story making myself get hooked to the book till I completed reading them all in one go. I also managed to find out few notable people who have contributed sizeable number of stories which includes Sruthi Sahini, anothergirlwithfantasies, Harsha MV, Soundarya_cool among others and I am sure as to how proud and happy they would have felt seeing their stories taking shape in the form of anthology. “I’m dark and bitter”, coffee complained. “Not everybody likes me to”, milk sympathized. Sugar brewed their sweet love and world witnessed the most loved taste. How true and thought provoking, the story was… This establishes the point that if LOVE is two-way, there is no stopping of it by anyone by any means (of course there are some exceptions which is miniscule). This book is a great attempt and honestly speaking, if I had known about this, I also would have taken part in this. Having said that, I hope the publishers and the sponsors would come forward to keep publishing various anthologies from time to time giving various young minds, a chance of getting published alongside established authors.